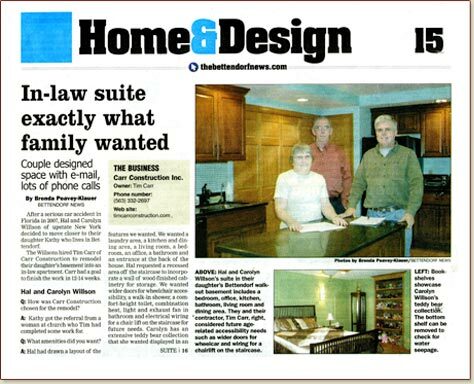 In-Law suite—Carr Construction does it all. The Wilsons hired Tim Carr of Carr Construction to remodel their daughter's basement into an in-law apartment. Q: How did you communicate with Tim from New York? A: Carolyn did a punch list via e-mail with Tim. She did a lot of reviewing of appliances on the Internet, narrowing down the styles of fixtures and appliances we wanted to and then made trips to Lowe's and Home Depot to see the product before we purchased it. Q: Was it difficult to plan this remodeling long distance?